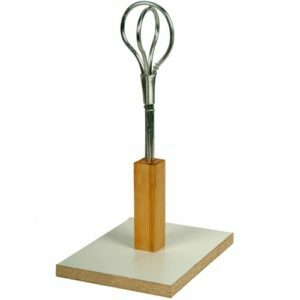 An armature provides the internal foundation on which to build your sculpture. Much like our own human skeletal system is the framework which keeps us standing in an upright position, an armature is used to keep the artist’s clay from collapsing, while also protecting the integrity of any outward extensions, such as thin limbs or legs. Truly, the most disheartening experience a clay sculptor can have is to create the ideal form, only to have his project fail due to the lack of a sturdy frame. If you are sculpting with more than 5 lbs. of Plastilina, moist clay or other sculpting medium, an armature is a necessity to serve as the internal support frame for your piece since the modeling material cannot support itself. Of all the head armatures, the head-bust armature is the most widely used and includes the head, neck and portion of the shoulders (bust). 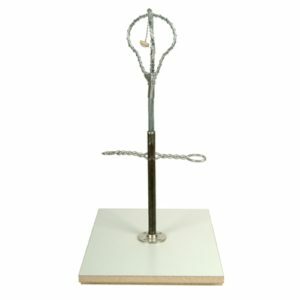 Our 24″ head-bust armature is constructed of strong, yet pliable, aluminum wire that is supported with a heavy duty steel backiron and cross bar that makes up the lower portion of the bust. 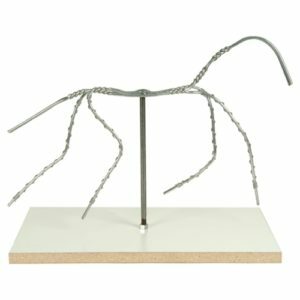 This non-corrosive and non-staining wire armature is securely attached to a base of Formica over heavy gauge plywood.